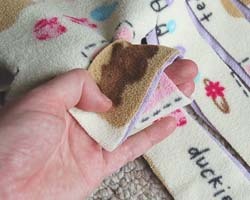 A no sew tied fleece blanket is a very easy winter craft, and there is nothing cozier than cuddling up with fleece! 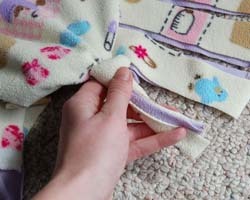 Because there are no sewing skills required - these blankets are very simple to make. This handmade blanket makes a wonderful gift too, and it is perfect to give away as a baby shower gift. You can really get creative with these blankets. 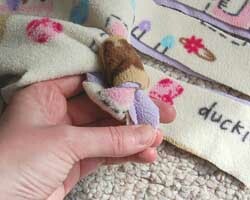 Since there are so many patterns of fleece available, you can make one for all the winter seasons. Think of this: a cute Halloween throw, then one for Thanksgiving with Autumn leaves on it, and one for Christmas in a holiday print. 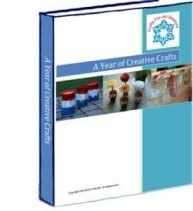 In January you can have one with snowmen or snowflakes on it, and follow up with a heart print for Valentine's Day in February. Finally, decorate with a shamrock throw for St. Patrick's Day. Usually these tied fleece blankets are made for children, but adults love to cuddle up with these too! Try making one to match your family room decor and you'll find yourself reaching for it each time to sit down to watch TV! 1. 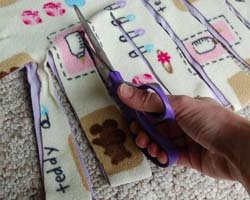 Begin by cutting two rectangles of the same size, from the solid color fleece and the patterned fleece. 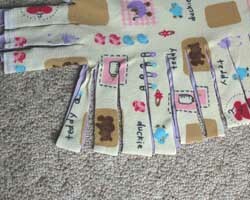 For the baby blanket above, the length was 55 iches by 45 inches (or 1.5 yards by 1.25 yards). 2. Place the two pieces of fleece on top of one another, with the right sides facing out. Using the ruler, measure off 2 inch marks along each side of the rectangle. Cut slits at each 2 inch mark, cutting up 8 inches in. Make sure you cut through both pieces of fleece. This creates the tassels. At the four corners, you will cut out a square you will not need, to create the look below. 3. To create the tassels, and to hold the two pieces of fleece together, you will make knots. To properly make the knot so they are all uniform, do the following technique: Hold both pieces of fleece together, and wrap them around your hand, beginning to form a knot (first photo below). Then bring the end of the fleece through the knot (second photo), then push the knot up as you tighten in, so it lies close to where the cuts begin (last photo). 3. 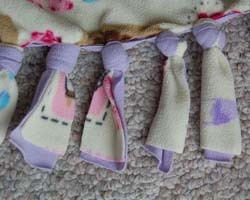 Continue on tying all the tassels, to create a knotted border, as shown below.